Every once in a while I come across an article that “hits home.” Today in this day and age where I believe play is an important part of all children’s lives I feel this is well worth the reprint. Through the lens of play research, we can see that there is a direct line between play deficiencies and some frightening public health and social trends: tragic statistics for obesity, 4.5 million children diagnosed with attention deficit hyperactivity disorder, an increase in childhood depression and classroom behavioral problems involving violence, and an inability to interact well with peers. Thanks for the great article! We're going to get outside today while the weather's still nice here in Oregon! Have a great week! I'm out giving comments to all my followers today! Thanks for posting this. I just may have to post a link to it on my blog, if you don't mind. Great article -- thanks for posting! This summer when Little M started walking, I started bringing him to the two nearby playgrounds. On the big kid side, the kids run, climb, chase each other, and seem to have endless physical energy. 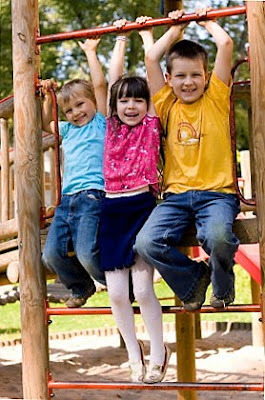 It is so sad that recess especially is being reduced, as all children really need the activity for not only their bodies, but also their mental well-being. Amen! I couldn't agree more!! This article is a great reminder. Shut everything down and send those kids outside!